I recently came across the results of a survey which found that 69% of the people asked believe that Islam encourages the oppression of women. If there is one thing I absolutly cannot stand it is when people hold uneducated opinions - or more accuratly, guesses - about Islam. Let's forget about opinion here and just look at the facts so that we can set the record straight. Islam brought women their rights during a time that in other countries women were being bought and sold as cattle. We Muslim women gained ownership over our money and were able to inherit while women around the world were themselves being inherited. We were given the right to education and work, and the right over our husbands' to provide for us regardless of whether or not we choose to work and regardless of how and when we spend our money. Muslim men are commanded to treat women with kindness and respect and not to take them as objects. Islam is the only religion to limit the number of wives a man can have, putting heavy conditions on the man, making it very difficult to marry more than one woman (in a time when men would marry hundreds as and when they pleased). Unlike other religions, Muslim women could choose their husbands' and were given the right to initiate a divorce. We are not seen as commodities with an expiry date, rather have an elevated and respected status in Islam as mothers, wives and daughters and important contributors to society. Women are NEVER degraded in the Quran and are described as equal to men. The words "male" and "female" are mentioned the same number of times in the Quran - 23 times each. The Prophet (SAW) mentioned the mother three times before mentioning the father once, when asked about the importance of parents. Unfortunately though, in this society most people are under the impression that being "equal" to a man means being the "same" as a man. It is for this reason that if a woman doesn't work, she is considered backward, oppressed and lower than a man because she is not acting like a man. The reality is that if women had been told to work so that the government could tax another 50% of the population instead of being told that they were being liberated, far fewer women would have jumped on the feminist bandwagon.They would have used their logic to deduce that men and women are ALREADY equal and it is totally ridiculous to gain equality with somebody simply by 'acting' like them. If I acted like my pet hamster would it make me equal to it..? I am genuinely so very thankful that I am a Muslim woman because I do not need to prove myself to men or to "gain" equality from anybody - I already have it, in it's most perfect form from my Creator (SWT). And it was given to me 1300 years before the women who did this survey. You shouldn't get all worked up over some poll. These are prolly the same people that believe all Arabs are Muslims, vice versa; or that Gaddafi is the king of Iraq, lol. I also find it funny that most of these feminist movements around the world were a reaction to their own worldviews, as opposed to being a reaction against the "oppressive" nature of Islam. Their opinions mean squat to us. Bravo sister!!! Go ahead and set the record straight! 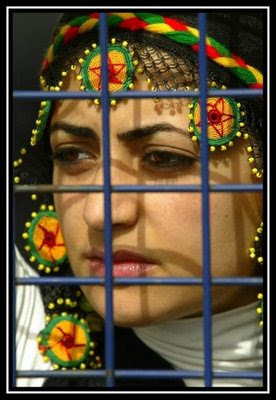 Are there many oppressed Muslim women in world? YES! Are they oppressed by ISLAM? NO! There's a lot of evil in this world- a lot of racism, sexism, prejudice, greed and so on. It is really a shame that the government and media in the West promote the idea that these problems exist only in "Muslim Lands" and "Muslim Culture." Muslims make up almost 1/4 of the world's population, so of course these problems will be seen in Muslim lands. But these problems exist everywhere, especially in the West, where whole civilizations were built on the shoulders of oppression! Very well said, Zaenab! You wouldn't mind if I share this with the Muslim community I'm well acquainted with on Facebook? I'll add the link over there so people know its original source. I must say that I really have been enjoying reading your blog. I am just studying Islam and find it so beautiful. Thank you for creating such a wonderful blog to read. gooooooooood blog MaashaAllah Allahoema Baarik! Salam sisters, I found this blog very interesting you should read, search or you tube Edward Wadie Said a well-known Palestinian American literary theorist, critic, and outspoken pro-Palestinian activist. Edward Said argues that the Europeans divided the world into two parts; the east and the west or the occident and the orient or the civilized and the uncivilized. This was totally an artificial boundary; and it was laid on the basis of the concept of them and us or theirs and ours. The Europeans used orientalism to define themselves. Some particular attributes were associated with the orientals, and whatever the orientals weren’t the occidents were. The Europeans defined themselves as the superior race compared to the orientals; and they justified their colonization by this concept. They said that it was their duty towards the world to civilize the uncivilized world. The main problem, however, arose when the Europeans started generalizing the attributes they associated with orientals, and started portraying these artificial characteristics associated with orientals in their western world through their scientific reports, literary work, and other media sources. What happened was that it created a certain image about the orientals in the European mind and in doing that infused a bias in the European attitude towards the orientals. This prejudice was also found in the orientalists (scientist studying the orientals); and all their scientific research and reports were under the influence of this. The generalized attributes associated with the orientals can be seen even today, for example, the Arabs are defined as uncivilized people; and Islam is seen as religion of the terrorist. An oppressive man is just that - it's nothing to do with his religion. I hate these sorts of misconceptions about Islam too. I can't help but feel if 9/11 didn't happen then they wouldn't be so prominent. I guess all we can do is re-educate those who are misinformed? fifi la femme: That is so true, I always think that if it hadn't happened there wouldn't be such a negative view on Islam. It's such a shame. Nothing else to say, but a hurrah to all that. Agreed. The reality is that if women had been told to work so that the government could tax another 50% of the population instead of being told that they were being liberated, far fewer women would have jumped on the feminist bandwagon.They would have used their logic to deduce that men and women are ALREADY equal and it is totally ridiculous to gain equality with somebody simply by 'acting' like them. Talk about completely misunderstanding feminism! (Or indeed feminisms, because there are many different ways of being a feminist.) It is indeed even possible to be both a Muslim and a feminist—those of us who are not illogical. You talk in your blog about attending university—do you think that would be possible for you as a woman living in the UK, whether Muslim or not, without the feminist movement? Feminism has opened up many doors for women. Not to mention that women were working outside of the home, in all parts of the world, long before the feminist movement came along—and yes, being taxed for it, too. Women had a lot of responsibilities but very few rights and that is what feminist movements have been fighting for. Anon: But I completely agree with you. What I'm saying is that Muslim women do not NEED the feminist movement to give them any rights. Islam has already given women their rights and the right to education was on the top of the list. Goodness - I don't think that ANY women were in a particularly good place before the feminist movement, Muslim women included. I'll ask you this: if Islam is so good at giving Muslim women their rights, would you rather live in a majority Muslim country, like Jordan or Saudi Arabia? Or would you rather live in the US. Dogma is one thing - practice is another. It's really irrelevant if Islam gives women more rights than other religions, because if it's not practiced that way, it's just words. Feminists fight for the rights of women to do as they see fit. You might not think that ISLAM needs feminism, but Muslims surely do. Praying.. or not, as the case may be.